Having tasted solitary confinement in an Austrian prison for fourteen months myself, I can only guess at the pressures to which she was subjected -- what blandishments, or threats of official brutality. Possibly too much about the end of SS Gruppenführer Müller ? Or perhaps that material is in the wrong place in the book? I reply: "No. The end of the book is already very tightly written, packed solid, and it would be a serious diversion to put Müller's end there at this length. I inserted it early to keep my reader attention during a period which I personally find very dull, the early Thirties." I found the Payne Best file very amusing -- and it contains more which I shall quote. I find this period 1933-4 very difficult to write coherently. The story does not "tell itself" the way that others do. A BOOKFINDER has found a very expensive copy of Beryl Irving: "The Dawnchild" (Faber, London, 1920s): "It is in very good condition with all illustrations present. The price would be £ 175 plus the postage at cost." I test him in my reply: "That seems far too expensive. I will inquire of the person who wanted it. The last one we bought cost fifty." A RATHER worrying message from H. about my vintage Silver Spur on which his men have now been working two years: Most of them appear to be electrical circuit problems. I tell him: "I expect that dampness is the cause of some of the faults, and that when you refill the air conditioner that too may spring back into life." This answer finally goes to Australian student Jacinta Tracey Lee. Do you believe that we should place restrictions on free speech? Yes, the law imposes certain obligations and sensible restrictions on us all, though these vary from one country to the next. The man who shouts "Fire" in a crowded theatre is one example, but there are more obviously everyday examples. I should not be allowed to call a girl a whore, if it is not true (or even if it is, because it is nobody's business but hers, literally); besides, doing so might lead to public disorder which would outweigh the public interest. Free speech should not be a licence to defame. People should not be allowed to libel others with impunity - i.e. to peddle stories and allegations which are both defamatory and untrue. Equally, people should not be allowed to incite others to violence, whatever the excuse (vide Iraq, Libya, and now Syria) whether on a local level or international, i.e. to propagate wars. And how would you say that such restrictions have hindered your work? In England, nobody tries officially to stop me speaking or writing. But unofficial sanctions can be just as harmful: Give a Dog a Bad Name and Hang him, is an old English adage: it works. Mainline publishers used to fight over the rights to my new books; now they are scared of offering for them, because of the indirect financial pressures which they rightly fear will be applied to them. There is no direct censorship in Britain, apart from the Defence laws, and the D-Notices which (rightly) prevent editors from publishing certain facts deemed to be harmful to the national interest. But there is a far more insidious form of censorship, and that is self-censorship. Journalists are not told what not to write, but they instinctively know which views to adopt, and which views to eschew, in order to keep their jobs. There is no paper-trail, but the result is the same. A blinkered press. An obedient academia. Journalists currently know better than to write about eugenics, or racial differences, or the people behind the Slave Trade, or the ethnic make-up of street crime statistics, because that is the sure way to the end of a career. So it is with history too. Historians know what views to adopt. Because their teachers also knew. And their teachers too, ad infinitum. From five p.m. I am phoning British Airways as instructed yesterday, to pay for the ticket change. Repeatedy I am told "the wait is 78 minutes|, "the wait is 62 minutes", "the wait is 64 minutes," etc. Finally I get through around one-thirty pm, but the line is so broken up I have to give up after five minutes and start all over. To cap the irritation, the British Airways staff woman then refuses to accept the MCO in payment, saying it can not be used over the phone. Oh, yes it can, and has been. So I pay by US card. Finally complete this annoying episode around ten-thirty p.m. Five hours clutching a phone. I never want to hear that endless-loop music again. A last-minute books sale for around $226 saves my mood. Bed at eleven p.m.
Jeannie tells me you sent her three boxes of stuff, but we are still looking for the rather expensive autographed volumes which I signed in Alexandria and DC for you. Please give us a clue. I hate to bother your lawyer-guy again over this. I'm enclosing a check for your postal costs on the boxes. Thanks again. I'm sure you're rushed off your feet, and it was good of you to take the time. Albert says he's looking forward to seeing y'all whatever that means. Mna. (right) wants to go to Poland for a week at Easter . . . to surprise her grandmother, which is nice. She is at war with her father, which is very reminiscent of J.
I CYCLE out to Stock Island for supper, against a fierce headwind, at times almost standing still on the North Roosevelt Blvd., while pedalling madly in the lowest gear. I read The New York Times while waiting for the prime rib. The NYT is a fine newspaper with excellent journalism and writing. In an article on the arrest of the Polish former prime minister for collusion with the CIA on secret prisons and torture chambers, I pick up one useful official US Government phrase to use in Himmler -- "enhanced interrogation techniques" as a euphemism for torture, i.e., verschärfte Vernehmung. Werner Best, deputy of Reinhard Heydrich, said they did not use it in the Gestapo, as it produced only polluted results. The painless but brainier ways were far better. The older Hollywood movies give a somewhat different picture, of course. On the way back I meet Mna., who is cycling round the island. She says she has an idea about the air ticket, and will surprise me tomorrow. 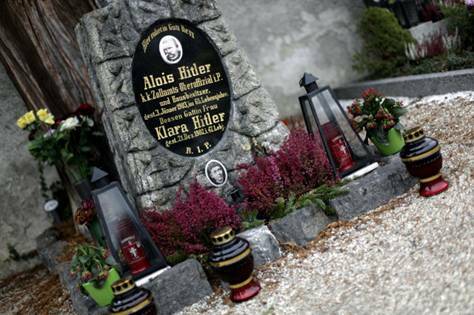 THE LOCAL parish priest at Leonding in Upper Austria has had the discreet little gravestone of Adolf Hitler's beloved parents dismantled and removed, and the gravesite flattened. He did it yesterday. They lay there undisturbed for over a century. The Austrian press reports this grave desecration with restraint. I assume that the priest did not ballot his parishioners as to what they thought; or that if he did, the ballot slips were visibly numbered and registered against their names. A photo shows the priest to be a scrawny man in his late fifties, grinning. 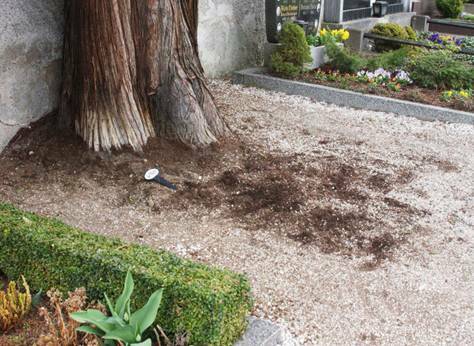 The tree marks the spot where Hitler's parents still lie: but for how long? He tells newspapers that a distant elderly relative of Alois Hitler was responsible for the upkeep of the grave and that this lady, whom he does not identify, agreed to the dismantling. How convenient. Having tasted solitary confinement in an Austrian prison for fourteen months myself, I can only guess at the pressures to which she was subjected -- what blandishments, or threats of official brutality. I remember an 88-year-old widow, Eleonore Kien, a poor pensioner, writing to me with her enfeebled hand that she had complained to the President of Austria about my incarceration; the secret police intercepted her letter, and she was fined a thousand euros under the same law. She no longer writes to me, being no doubt where Alois and Klara Hitler are. The wretched priest complains that the grave attracted too many sympathetic pilgrims. Many more than will ever visit the graves of recent presidents or their parents, I suspect. The same excuse was offered last year in Germany, for digging up and removing the entire grave site of Rudolf Hess and his family, "with the consent" of his descendants. These parish priests, these truly Godless men, are playing politics with the long-dead. They are not the first. After Benito Mussolini had telephoned his placet to Germany's Anschluss with Austria in March 1938, Hitler turned to his staff and said that now for the first time in over a decade he could return to his native Austria and do what Chancellor Kurt Schuschnigg and his predecessors had forbidden -- visit the grave of his parents at Leonding. Now no longer. Friendly Austrian corps students took me to see the grave when I spoke in Linz in the 1980s. Hitler's childhood house was on the other side of the street, used as a store for the gravediggers. Albert tells me he also went there once, and left a bunch of forget-me-nots on the grave. If I am a pilgrim, I am at least an even-handed one. I went one Sunday afternoon with Sally Cox to view the famous bust-topped gravestone of Karl Marx in Highgate cemetery in London. That is unlikely to share the fate of the grave of Hitler's parents. One compares modern Austria's actions with Hitler's own reverence toward the mortal remains of the famous -- with what ceremony he ordered the corpse of the Duke of Reichstadt, the only son of Napoleon Bonaparte, Emperor of France, returned from Austria to the French. On December 15, 1940 with much pomp and circumstance the boy was reburied next to his father's porphyre sarcophagus in Paris. The parish priest of Leonding -- his name is Pfarrer Kurt Pittertschatscher [write to him at Michaelsbergstrasse 25, Leonding, Linz, Austria] -- was responding to pressure from the Mauthausen Committee and the Leftist lobby Network, run by a man called Robert Eiter. Oh, joy; oh thankyou, thankyou, God! What an unfortunate name. Eiter means pus in German. Not puss, pus. Eiterbeule is an abscess. That makes him an expert? He is wrong if he believes he has lanced one now. I GO with Albert for breakfast. He uses the phrase "low-lifes," which I shall also shoe-horn into Himmler. I am now wading knee-deep in the blood and politics of the Röhm purge. Supper at Bobalou with Albert and Mna. Turkey pot pie, of which I have a couple of spoons only. I SPEND half an hour on the tennis court with Mna. The first time since prison in Vienna. It is a test for my new metallic replacement parts, which they withstand, but not the muscles yet. A dash to stop a ball has me wincing. Running is out for the moment, it seems.